QC activities verify that quality attributes conform to requirements. Successfully completing each QC inspection results in a successful project. For example, the vegetation removal process produces land that is adequately prepared for the follow-on processes such as the geophysical survey and anomaly resolution. QC checks occur at designated periods during each activity, when the project managers have determined that the measurement can indicate that the MQO requirements of the task are being met. These inspection points are inserted into the QAPP to identify the points at which the process is ready for testing and measurement to ensure that it was adequately performed. For example, for a vegetation removal, typical QC checks include documenting that the site workers understand their tasks prior to starting work, observing the field team’s work practices as the task is performed, and ensuring the grass height conforms to the established specification. These inspections and measurements are documented as the task is performed, and together they document the adequate performance of this task. 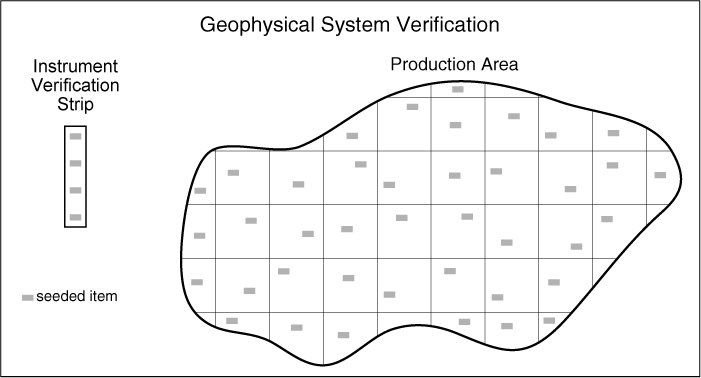 GSV (ESTCP 2014) is a simple but rigorous QC process used to confirm that a geophysical sensor is operating properly and to provide ongoing monitoring of the quality of the geophysical data collection and target selection process. This process includes two key elements: an IVS and production area blind seeding. These elements are presented in detail on the Environmental Security Technology Certification Program (ESTCP) website. Figure 6‑1 presents a schematic of the IVS and blind seeding for an example project site. Figure 6‑1 conceptually illustrates the placement of buried blind seeds throughout the project area. A separate IVS location includes a few buried objects to verify that the geophysical detection system is operating properly. Figure 6‑1. GSV schematic including IVS and blind seeding. An IVS consists of a line of a few (typically three or four) objects buried in a representative, open area close to the location where the geophysical survey equipment is operated. An objective of the IVS is to verify that the AGC or traditional DGM geophysical detection system is operating properly at the onset of the project. The IVS is used to confirm that the site noise levels will permit the depth of detection requirements identified during the planning stages. The IVS is also used as an ongoing check during the project (at the beginning and end of each data collection day). The objects should be observed in the data with signals that are consistent with physics-based model predictions. The IVS also verifies that the geolocation system provides accurate sensor location data. Typically, the IVS contains a nearby noise strip that does not contain buried targets. The noise strip is used to characterize and check the dynamic noise level of the geophysical instrument and site background noise. Analog detection methods use an instrument test strip that is similar to an IVS but is not considered part of the GSV process because it lacks a recorded response and the rigorous evaluations made for digital systems (USACE 2015). For the purposes of this document, the term IVS is used. Blind seeding is a common QC process on MR projects in which QA or QC personnel intentionally emplace munitions-like objects (seeds) in the MR project production area to test and validate the UXO/DMM detection and classification process. Although the specific purpose and procedures for blind seeding vary depending on the type of geophysical system being used, blind seeding is a commonly accepted (and often required) QC activity on MR projects using geophysical sensors. Blind seeding uses seed items that may be similar to the intrinsic characteristics of actual munitions expected to be found in the production area. The blind seeds may also be a standardized object that gives a repeatable geophysical response. If the geophysical production team detects the blind seeds, and the detection data are within established parameters, then the geophysical system was producing geophysical data at that time that conform to the established requirements. On the other hand, if the MR production team fails to find a blind seed or if the detection data on the blind seed fall outside of the established range, then inadequate processes or implementation may be occurring, and the RCA/CA procedures should be initiated. The type, quality, amount, and level of tolerable uncertainty in the data (confidence) are developed and articulated through the DQO process. Uncertainty in data is assessed by identification and conformance to MPCs, MQOs, and other QC requirements. Certain geophysical data collection technologies may require different QC tests to demonstrate conformance to requirements. Common geophysical data collection MPCs include completeness (% of MRS/DU analyzed), sensitivity (detection), selectivity (classification), and detection limit (depth). Detailed and documented QC/QA procedures are required for each of these geophysical technologies and should be expected in all MR projects, regardless of the selected technology. Each method has different QC tests that must be performed and checked by the field team and data analysts to ensure conformance to MQOs. Parity, however, is required regardless of the methodology used. For example, full coverage is needed regardless of data collection approach, but QC testing methods and frequencies vary. This variance occurs because some processes can be subjected to inexpensive, quantitative, 100% QC inspection (such as DGM coverage) and some cannot (for example, analog coverage). In addition, the phase of the MR project (RI versus RA) may require different QC approaches. Further information on these methods and their QC requirements can be found in “Environmental Quality- Technical Guidance for Military Munitions Response Actions” Engineer Manual EM-200-1-15 (USACE 2015). Specifics on QC are presented in Chapter 11 of this manual, including detailed QC requirements and standards for analog detection methods and DGM. AGC specific information can be found in “Geophysical Classification for Munitions Response Sites” (GCMR-2) and the IDQTF AGC-QAPP template. With analog detection methods, the detection system is a combination of the instrument and the operator. Decisions are made in real time and are heavily influenced by the operator’s level of experience and attention. Also, since there is no permanent digital record of coverage or items detected, the operator/instrument system must be tested, usually through large numbers of seeds at sufficient frequency to ensure MQOs conform to MPCs. Example QC requirements for analog detection methods include repeatability (instrument functionality); dynamic repeatability (IVS and blind seeding); coverage, detection, and recovery; and anomaly resolution. Specific performance standards and frequencies for these requirements are presented in Chapter 11 of Engineer Manual EM-200-1-15. DGM relies on a qualified geophysicist to oversee data collection and to process and interpret geophysical data to determine which anomalies to dig (based on amplitude threshold). Therefore, quality requirements are defined for the data collection (such as coverage and speed) and analysis (for example, seeds selected at the correct location and with expected amplitude response). QC tests may vary depending on the positioning system used (GPS versus line and fiducial). Example QC requirements for DGM methods include static repeatability (instrument functionality), along-line measurement spacing, speed, coverage, dynamic detection repeatability (IVS and blind seeding), dynamic positioning, target selection, and anomaly resolution. Specific performance standards and frequencies for these requirements are presented in Chapter 11 of Engineer Manual EM-200-1-15. AGC takes traditional DGM one step further by eliminating the sole reliance on instrument amplitude readings and using intrinsic properties of a buried metal object. The principal-axis polarizability decay curves are used, which reflect the size, symmetry, material composition, and wall thickness of the item. Decision making is based on interpretation of these modeled parameters, which requires additional MQOs that are not possible with DGM alone (such as library match of IVS items ≥ 0.9). Another MQO might be inversion results that correctly predict one or more physical properties (for example, size, symmetry, or wall thickness) of the recovered items. Required MPC and MQOs for AGC are defined in the AGC-QAPP template. The fundamental role of QA/QC is to establish and monitor conformance with the project requirements. As a result, discovering nonconformity is common and should be expected. Nonconformity is a nonfulfillment or failure to meet a requirement. Discovering nonconformity should be viewed by the project managers and regulators as a success because it demonstrates that the QA/QC program is working. Moreover, project managers can identify and correct the nonconformance and thus allow the project to achieve its goals. The person responsible for the process exhibiting nonconformance often has the authority to stop the process, perform a root cause analysis, and implement corrective actions under the QA plan. An overview of the root cause analysis and corrective action concepts are presented in Appendix A. The UFP-QAPP defines a procedure (for example, a nonconformance report or deficiency notice such as USACE’s Engineering Form (ENG) 6048 – Munitions Response Quality Assurance Report form) that formally documents the nonconformance, root cause analysis, corrective actions, and approved departures. Advances in technology and improved, standardized processes and procedures are changing work practices for MR projects. New advances in technology are driving these changes. Examples of these recent developments include AGC and new requirements for accreditation of contractors performing AGC through DAGCAP. Additionally, the Department of Defense Explosives Safety Board (DDESB) has upgraded the training requirements for UXO quality personnel (DDESB 2016). The introduction of AGC to the Military Munitions Response Program (MMRP) toolbox has been a significant technological advance, which has affected the MR community (DOD, contractors, regulators, and stakeholders). AGC uses specialized advanced geophysical sensors to classify whether an underground object is a TOI such as UXO/DMM or not a TOI (highly unlikely to be UXO/DMM). These advanced sensors have limitations, and sometimes it may not be possible to determine whether a subsurface object is TOI or non-TOI. The object or objects in this case are listed as indeterminate (inconclusive). To be conservative, the subsurface objects classified as TOI or inconclusive are removed and visually examined but the high-confidence non-TOI are left in the ground. AGC is not appropriate for all sites and its selection should factor in site specific characteristics. ITRC’s Geophysical Classification for Munitions Response Fact Sheets (GCMR-1) and Guidance Document (GCMR-2) clearly explain the process of AGC. These resources also describe the benefits and limitations of AGC, including site-specific characteristics that can impose limitations on its use. Finally, these resources discuss the information and data that regulators monitor and evaluate related to the use of this technology. The result of using AGC is greatly increased efficiency of MR projects. Needless excavation is eliminated because objects that do not represent an explosive hazard can safely be left in place. Additionally, AGC delivers higher fidelity data that has greater dynamic range than other methods, and AGC measurements are more precise. AGC allocates scarce remediation funds and contractor efforts to complete removal at a faster pace compared to other methods, and it does so with greater certainty than traditional “mag and dig” or DGM methods. In support of the AGC effort, the DOD Environmental Data Quality Workgroup (EDQW) has developed the DAGCAP to accredit organizations that perform advanced classification at DOD MRS. In April, 2016, the Office of the Assistant Secretary of Defense issued a memorandum that formally established the DAGCAP and required geophysical classification organizations (GCOs) to be accredited by January 2017. The DAGCAP uses third-party accreditation bodies (ABs) to provide a unified program through which GCOs (for example, UXO contractors) can demonstrate competency and document conformance to a set of requirements. The DAGCAP Requirements are based on the international standard ISO/IEC 17025 (IOS/IEC 17025):2005, General requirements for the competence of testing and calibration laboratories, supplemented by the DOD Quality Systems Requirements for Organizations Performing Advanced Classification (DOD QSR). The EDQW finalized the DOD QSR in November 2015. This guidance is included on the Munitions Response Program page, along with other information on the DAGCAP such as a list of accredited firms. Additional information on DAGCAP is available in a fact sheet, and more details on implementing QA and QC on AGC projects is included in later chapters of this document. The UFP-QAPP is the DOD-preferred project-level format for planning, implementing, assessing, and documenting an MR project. USEPA, DOD, and Department of Energy collaborated to develop the UFP-QAPP format. The UFP-QAPP integrates all technical and quality aspects for the MR project, including planning, implementation, and assessment. This format documents how QA and QC are applied to an environmental data collection operation to ensure that the results obtained satisfy stated requirements. USEPA provides an informative Frequently Asked Questions and includes information on the origins of the UFP-QAPP requirement. In addition, the UFP-QAPP documents key processes, data quality requirements, data quality assessments, and documentation and record requirements. Development of a UFP-QAPP applies to investigations, remediation activities or remedy solutions, and final cleanup and long-term management/stewardship activities. One or more UFP-QAPPs for an MR project, each with its own set of SOPs and supporting documents. Multiple UFP-QAPPs are likely if there are different objectives for different sampling events. The IDQTF developed an overall MR-QAPP toolkit (IDQTF 2018) and a specific AGC-QAPP (IDQTF 2016) is required for AGC MR projects. Specific MR-QAPP and AGC-QAPP template worksheets are referenced within sections of this document that correspond to the worksheet content. Unforeseen issues can arise during project execution that result in deviations from the UFP-QAPP. The UFP-QAPP is intended to be nonrestrictive and should be amended to document the changes, then approved by the authorized authority. UFP-QAPP Worksheet #6 and Worksheet #29 specifies the communication pathways, procedures, required approvals, and documentation necessary for updates to the UFP-QAPP. Any nonconformances during project execution and the corresponding corrective actions must also be documented and approved. Project Management Plan: Defines deliverables, approach, schedule, and resources required to complete the project. Quality Assurance Surveillance Plan: Establishes procedures and guidelines that the Government uses to evaluate the technical performance of the contractor during the project.